I do not think that I have been this excited about a nail polish since OPI came out with I'm Not Really a Waitress back in the day. One of the pros about having a cosmetology license is that we get to go into salon supply stores and buy products for considerably less than you find them in stores. This can also be a con - example being that yesterday I went into State Beauty to get hair color and walked out with two new nail polishes, shine spray, a brush, and lipstick. In my awe over their sale and Christmas merchandise, I had forgot to purchase hair color. 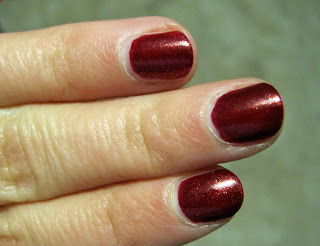 Oh well, because what I did get is this new OPI color from their Christmas collection called Dear Santa. It is a bright red with gold and red flecks of glitter throughout. Click on the name and you can check out how the color looks on different nail lengths and skin tones at OPI's website!